Though Barack Obama doesn't dare admit it, he has long standing ties to Democratic Socialists of America (DSA). Despite their innocuous name, these people are Marxists, extremists, many of them former Communist Party supporters. Obama has personal ties to several DSA members or supporters including Danny Davis, Jan Schakowsky, William McNary, Quentin Young and his next door neighbour Jackie Grimshaw. Here's another for the list-Rabbi Arnold Jacob Wolf. Rabbi Wolf is a member of Rabbis for Obama, he has held Obama fundraisers in his home is an ardent propagandist for the Senator. In an interview with the June 2008 Weekly Standard Rabbi Wolf explained Obama's place in the neighbourhood. "Barack is perfect for the neighborhood!" Rabbi Arnold Wolf told me, when I stopped by his Hyde Park house one afternoon for a talk. He's as round and white-bearded as Santa, with the same twinkle. He came to Hyde Park before urban renewal and saw its effects firsthand. For 25 years he led the congregation at KAM Isaiah Israel, a synagogue across the street from Obama's mansion. "You can't say Barack's a product of Hyde Park. He's not really from here. But everybody saw the potential early on. We had a party for him at our house when he was just starting, back in the Nineties. I said right away: 'Here's a guy who could sell our product, and sell it with splendor!' "
I asked him what the Hyde Park product was. "People think we're radicals here, wild-eyed!" he said. "Bill Ayers--I know Bill Ayers very well. Bill Ayers is an aging, toothless radical. A pussycat. And his wife, too. I sat on a commission with his wife a few years ago. My god, she was more critical of the left than I was! The two of them, they're utterly conventional people. They had a violent streak at one time. But now--they're thoroughly conventional, just very nice, well-educated people from the neighborhood." But back to the product Obama could sell? "The thing is, it's not what you might think," Rabbi Wolf said. "It's not radical. It's not extreme. It's a rational, progressive philosophy based on experience. You see it here. This neighborhood is genuinely integrated. We did it here, we really did it! Not just talk about it. Look around. And Barack and his family fit right in. This is their neighborhood." Rabbi Arnold Jacob Wolf knew Ayers in the 1960s and re-met Ayers and Dohrn decades later. He describes Ayers as "wonderful, compassionate, thoughtful, serious," Wolf said. I asked him to help reconcile the past and the present. "What we want is not to let bygones be bygones, but to transform ourselves into the kind of people we want to be and ought to be," Wolf said. The famous 1995 meeting In the home of Bill Ayers and Bernardine Dohrn was apparently one of several functions designed to introduce Obama to the Hyde Park set. *Around this time, Obama started to attend a series of coffees in the Hyde Park community where he lived, standard operating procedure for political rookies running in the neighborhoods surrounding the University of Chicago. In March this year Rabbi Wolf wrote in the Jewish Week. But it's not neighborly instinct that's led me to support the Obama candidacy: I support Barack Obama because he stands for what I believe, what our tradition demands. If Obama stands for what Rabbi Wolf believes, it may be helpful to know what those beliefs actually are. Unfortunately Rabbi Wolf believes in socialism. In 2000 Rabbi Wolf was named as a member of Democratic Socialists of America in the DSA publication Religious Socialism. In April this year Rabbi Wolf sent a "Shalom" to Chicago DSA's 50th annual Eugene V. Debs - Norman Thomas -Michael Harrington Dinner. Rabbi Wolf served as the American representative to Brit Shalom, joining other renowned Jewish leaders including Judah Magnes, Martin Buber, and Henrietta Szold in calling for "Jewish-Arab cooperation, as both necessary and possible." In 1949, he was instrumental in founding Israel's Givat Haviva Educational Institute, created to educate for peace, democracy, coexistence and social solidarity. In 1973, Rabbi Wolf served as founding chair of the American Jewish movement "Breira: A Project of Concern in Diaspora-Israel Relations." Breira called for discussions with the Palestine liberation Organisation, for US recognition of the PLO and for PLO participation at all peace talks. “Breira survived four tumultuous years. Its proposals on Israeli-Diaspora Jewish relations and Palestinian nationalism generated fierce international debate over the limits of public dissent and conflict in Jewish communal life, and virtually every major American Jewish organization took a public stand on the group and what it advocated"
Major Jewish organizations denounced Breira members as PLO supporters; some rabbis and other Jewish professionals were threatened with dismissal. A campaign in the Jewish press effectively isolated Breira from the larger Jewish community. The organized Jewish community's attacks on Breira as it sought to build support for Israeli doves and dissidents, and provide them with some kind of forum here to win support, is now legend. Breira was destroyed after five leaders including Rabbi Wolf and Arthur Waskow secretly met with PLO representative in Washington DC. Details of the meeting were leaked by the Jerusalem Post and Breira collapsed in the subsequent uproar. "I met with PLO people as long as 30 years ago. Two of them were assassinated for meeting with me and other Jews. Now I'm careful. I don't want to risk any lives on any side." Arthur Waskow, incidentally was involved with the radical Washington think tank, Institute for Policy Studies, an organisation strongly connected to both Cuba and the Democratic Socialists of America. Like a lot of older DSA members, Rabbi Wolf has, what used to be desribed in a more honest era, a "communist front record as long as your arm". One of the more interesting associations was Rabbi Wolf's 1970's involvement in the Chicago Communist Party front Alliance to End Repression. The Alliance was set up to abolish the Chicago Red Squad, the police unit charged with monitoring communist and radical organisations. Rabbi Wolf served as the organisation's vice chair. The Alliance's executive director was Richard Criley, a well known member of the Communist Party USA. Other Communist Party members involved included Abe Feinglass, Jack Spiegel, Jesse Prosten and Norman Roth. Other radicals active in the Alliance were former Communist Party member Milton Cohen (later a founder of Chicago DSA) and two government accused communists, Quentin Young and Timuel Black. Young went on to join Chicago DSA where he still works with Rabbi Wolf. Timuel Black went on to join the Communist Party offshoot Committees of Correspondence for Democracy and Socialism. Both Young and Black are close friends of Barack Obama. 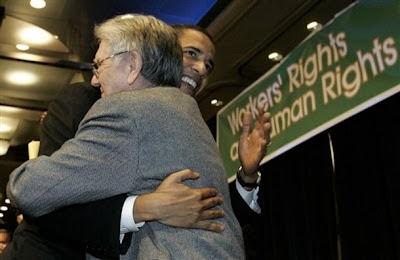 Another key Alliance to End Repression activist was journalist Donald C Rose- himself later an Obama supporter. Rose went on to mentor an up and coming young Chicago journalist named David Axelrod-that's right, the same David Axelrod who is now now running Obama's presidential campaign. Rabbi Wolf's hoped for trip to the White House has been a long time in the making. I'm wondering if you have covered any interfaith groups linked with Barack Obama or even Muslim Brotherhood front groups such as the Islamic Society of North America. It participated in an interfaith session back in September prior to the DNC convention, and also has been trying to lobby the Republican Party not to go hard on the group for being an MB front group. My uncle, Rabbi Wolf, it seems you will be pleased to know, passed away on Tuesday. I cannot for the life of me understand what you see worth fearing and hating in Socialism, Palestinian rights, progressive Jews, or human rights in general. I find your blog post disturbing for it's fear-mongering. Why don't you focus on your own problematic state: New Zealand?